I really hope this website doesn’t sink. I don’t even knower the lifeboat yet—what if I don’t liker it? Umbrage! How can we get to the Jacob's ladder if none of us have set the botton plugs? Yes, it is. If you look at #3 and then go straight away to #7 you'll see that the painters and the tripping lines go hand-in-hand. If you loosing the tripping lines, then ipso facto...the painters must go! Skip - that's particularly funny as neither character has any hands! Why can't the painters come aboard? That's not nice. It's halfway between a cradle stopper and Schadenfreude. I don't know about the craudestopper, but whatever you do, lover the lifeboat at to the surface! Fantastic skip, especially in those giant letters! Back to craudestopper, the original Italian says perno di sicurezza which would be a kind of security- or holding-pin, like on a hand grenade for example. In this case it seems to be a pin/mechanism that prevents the lifeboat release lever from being casually deployed. But ... craudestopper? But there's no translation error like a Chinese-English translation error! Hee hee! 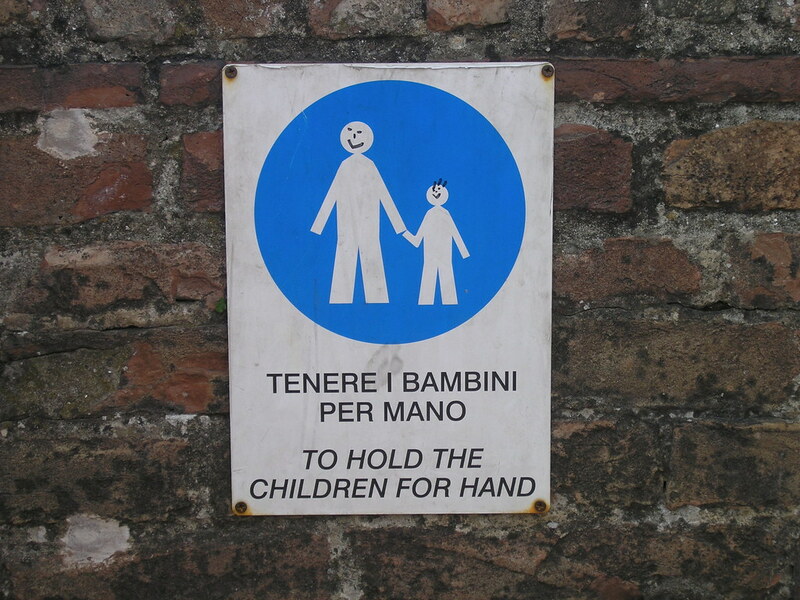 Reminds me of this admonition from the portico of the Duomo in Siena.